Published in the South Kent Gazette, 8 October, 1980. A site for a Catholic Church had previously been bought in Ashen Tree Lane, but the ground not being suitable, it was sold and a new site, part of Johnson’s nursery gardens in the Maison Dieu Road, was purchased in 1864, for £450. The building of the church was commenced in 1867, and it was opened on the 15th May 1868. The opening ceremony was by Archbishop Manning, of Westminster, who preached and Dr Grant, Bishop of Southwark. The music of Mozart’s 12th. Mass was used foil the first Mass. The church, which is of the Pointed style of the 13th centurv, is 90£t. lone end 40ft. wide inside, and was built of Kentish rag and Bath stone dressings, from the designs of Mr Edward Welby Pugin, at a cost of £2,300 by a Mr Hodgson, of Ramsgate. In 1873 the church was completed by the addition of an apse. Schools adjoining the north side of the church were built in 1872 at a cost of £527, and were subsequently enlarged. The War Office contributed £50 towards the building of the church. Clyde House, standing at the junction of Godwyne Road and Park Avenue, was built in 1865 by Mr J. N. Tunbridge, and he first resided in it. For a good many years it was the residence of Mr Robert Hesketh Jones, manager of the Dover Gas Company. Brook House, now the offices of Dover District Council and formerly those of the Town Clerk and other Borough Council officials, was built by Mr Moxon and he lived in it for a short period. It was afterwards the residence of Major-General Ellice, Commandant of the South-Eastern District. Subsequently it was purchased by Mr John Birmingham, the well-known proprietor of the Ship and the Lord Warden Hotels, who was Mayor of Dover four years, and who, on retiring from business, made Brook House his residence, where he died on the 3rd February, 1875, at the age of 80 years. The mansion remained in the possession of the Birmingham family until August, 1886, when it was disposed of, at an auction sale by Messrs. Terson and Son, for £6,000, Messrs Steriker Finnis and Sons being the purchasers. Soon after the lower part of Brook House grounds was severed from the mansion. Here the seven houses called The Paddock were built on the lower aide of a short road, with a Girls’ High School adjoining Brook House grounds, the last named building having been built by a local company. This school was subsequently purchased by the Kent Education Committee for use as a county school for girIs but when other, more suitable, premises became available this idea was dropped. Brook House was for some years after 1886 occupied by Mr John Finnis, who died there in November 1892. It then became the residence of the Misses Humphreys. In the grounds of Brook House there was once a great thicket of trees in which lived a colony of rooks, successive generations of which are said to have occupied the trees round about, probably since the founding of the Maison Dieu in the days of King John. After the town bought the property the grounds were tidied up and hard tennis courts were put down between the house and Maison Dieu Road. Elms and lime trees were felled and with them went the rooks. Charlton Lodge was a large private residence which stood in extensive grounds on the east, at the upper end of the-road. It was there long before the creation of Maison Dieu Road, and was the residence of Dr Robert Sillery in the first half of the 19th century. The building stood on freehold land in the midst of Crown lands, the site having been carved out of the King’s estates in Restoration days as a reward for loyalty of its owner. In 1927 the house was bought by the local Co-operative Society who pulled down the house and built on the site the old Co-operative Hall, a dairy and motor garage. The hall has subsequently been taken over by the Post Office. 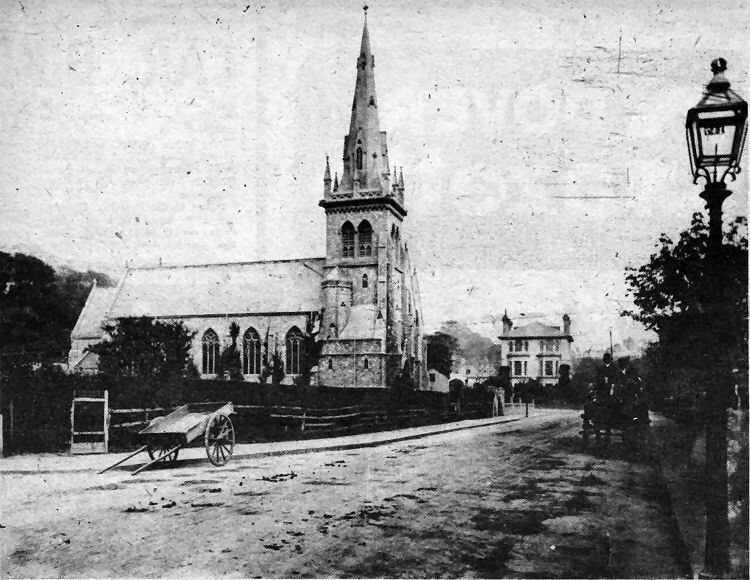 New St. James’ Church standing in splendid isolation in Maison Dieu Road about 100 years ago. Like the church the large house to the right, on the corner of Eastbrook Place, has long since been demolished. Pictured above is the miniature “Crystal Palace“ greenhouse at George Clark’s Maison Dieu Road nursery, opposite what is now the Health Centre. Mr Clark’s business was founded in 1838 and steadily developed until, trading as G. & A. Clark, it became the largest in this part of the country. Apart from the nursery land in Maison Dieu Road there were other sites in Frith Road, Old Park, Bushy Ruff, Barton Road and a shop at New Bridge. The Maison Dieu Nursery was formerly a subscription promenade garden, run by a Mr S. Johnson. When he died Mr Clark stepped in, acquired the site and erected the handsome greenhouse local people dubbed the "Miniature Crystal Palace.“ Covering an area of nearly 3,400 square feet the structure survived until comparatively recent years. The business was in later years taken over by Messrs Fisher and Good burn.